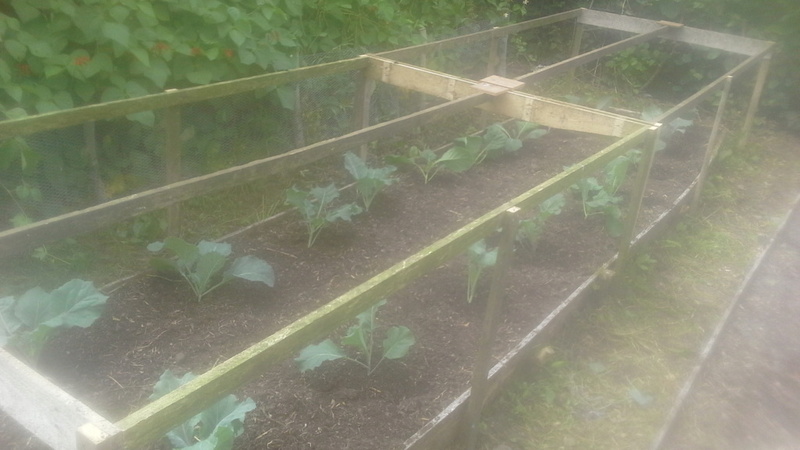 Winter cabbages planted out this morning: Red Drumhead, Savoys and January King. The frame will be covered with netting to keep out pigeons and rabbits. Kales and Brussells to go out this afternoon. It all looks very neat and tidy Sean. I think I must plant mine out to soon as they have all bolted. I have a bad habit of sowing all my seeds to soon. Hope this afternoon was a success. How far apart do you plant them when they are in the beds? Deryn, the drought would have encouraged them to bolt. Looking back, I think I sowed these around the 10th June. I pricked them out, first into modules and then into individual 5 inch pots. I planted them roughly 18 inches apart in the row, with the rows about two feet apart, which leaves room for a line of leeks down the middle. I would have sown mine in April when sowing all other seeds. Will try and remember to wait next year. I will also plant them in bigger pots as I leave them in seed trays 12 to a tray when I thin them out. Remember! Now is the time to sow your Spring Cabbage seed. You should be planting them out in September / October. They will over-winter and start growing fast in Spring. Plant them 9 inches apart in the row and pull every second one for Spring Greens and allow the others to heart up, which they will do from April through to June. The great thing about Spring Cabbages is - no caterpillars! There are several good varieties - Wheeler's Imperial, Durham Early, April, Flower of Spring (makes huge cabbages on good ground) and others. I think they're the best cabbages of all.